1- Start by cutting the dowels down. For my spools, I cut 3 1/4″ pieces. For my bobbins, I cut 1 1/2″ pieces. To start, just make an indentation with the blade all the way around the dowel, then snap. 2- Loosen the fastener at the top of the hoop as much as possible without screwing it all the way out. This should leave you with enough space for the dowels. For spacing purposes, place dowels on the top, bottom, and sides- think 12 o’clock, 3 o’clock, 6 o’clock, and 9 o’clock. 3- The spaces in between the dowels are going to be tighter, so you’ll want to put your next dowel in right next to one of the dowels you already had in place, and then slide it over. Spread dowels around the hoop fairly evenly, then you can space them perfectly even. 4- Once the hoop is set up how you’d like it, set it upside down on some newspaper and place a small amount of wood glue at each joint. Start with a small amount of glue, and if you decide you need more later, you can go back and re-glue it. Let dry. what a great idea! oh my goodness! Too brilliant. Love how easy it is! Good idea! I was just thinking I needed to nail some holes in boards for my thread, but I’m intrigued! Great idea! What a top idea! 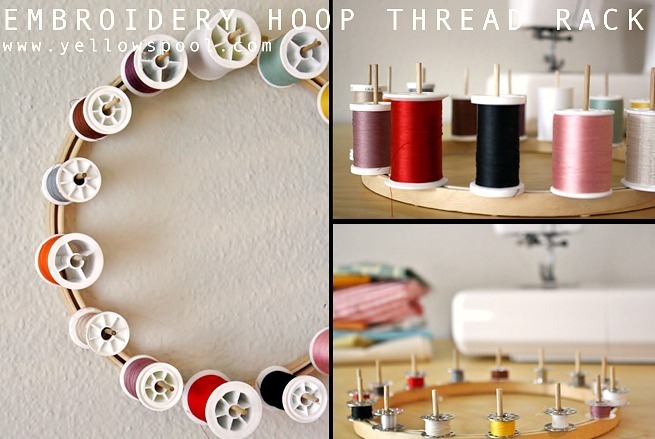 Have some unloved embroidery hoops, will def be giving that a go. I would cut the dowel 4 inches long to accommodate both the spool of thread and matching threaded bobbin; keeping them together. I totally agree! I’m also going to do smaller hoops inside a large one so I can maximize my storage amount. I’m excited to do it. Thanks for sharing!